5-A-DAY PORTIONS One serving of this recipe counts as 2 of your 5-A-DAY target of fruit and vegetable portions. Our beautifully rich lentils with a lovely roast chicken breast, perfect for a mid-week dinner with a glass of red wine. Classic, quick and delicious. Season the breasts with salt and pepper and sear, skin down in a hot pan until brown. Transfer to the oven with a squeeze of lemon and the crushed garlic and roast for 15-20 minutes at 180°C fan. Chop the bacon and fry until crispy and the fat has rendered out, remove and reserve. In the same pan add finely diced onion, carrot and celery and sweat down slowly on a low heat until caramelised. Add the herbs. Add the drained green lentils, the mushroom soup, the bacon and a tsp of English mustard, bring to a low simmer and heat through for five minutes. 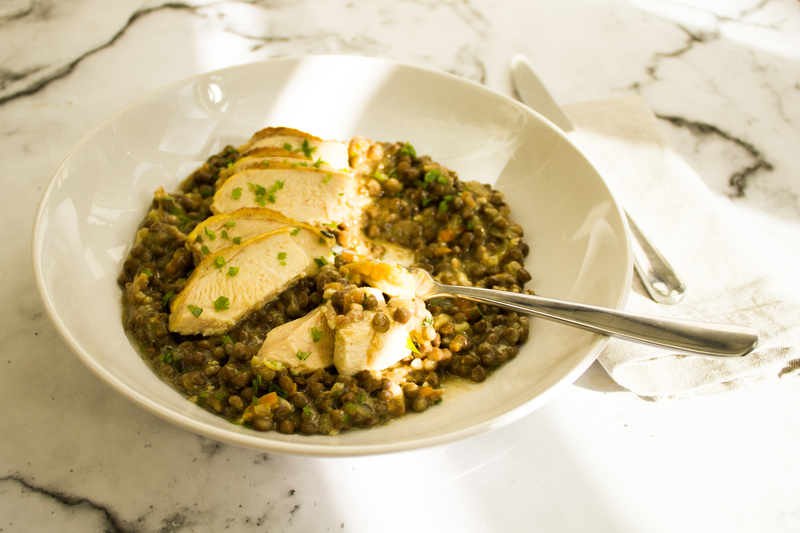 To serve, slice the chicken breasts, top with the lentils, drizzle over some olive oil and scatter with some finely chopped parsley.